Last night’s sandwich was pea-meal ham, egg and cheese on toasted English muffins, with some raw vegetables, I’m still deciding on tonight. This recipe was screened by Mom and is directly from the back of Ellison’s Best All Purpose Flour bag. I still need a lot of bread making practice, but these worked out great for my first go at cinnamon rolls and sticky pecan buns and I found that this recipe makes 2, 9 x 13 pans of rolls/buns (but I also think it could be stretched to 3 pans – still make 2 ‘logs’, but cut them into 18 pieces each). In a large bowl, combine the 4 cups of flour and the yeast and in a second bowl, whisk together the eggs, sugar and oil and then add in the water and mix well. Pour the wet ingredients into the dry and mix thoroughly – I used a heavy duty wooden spoon and took my time scraping down the bowl etc. In another small bowl, combine 3 cups of flour and the salt, saving the last cup of flour to add in as needed. Mix in the flour and salt mixture and use your hands towards the end of mixing – at this point it was in dough form for me, though sticky, so I turned it out onto my floured counter (using the flour from the last, fourth cup), and kneaded it. The recipe says to knead it for about 5 minutes, so I did this while sprinkling it with flour to keep it from sticking to the counter and after about a half cup, I had what I thought was a lovely large ball of elastic, non-sticky bread dough. Get another new bowl (glass) and grease it (I just used cooking spray), put the dough in, cover it with a clean, damp tea towel, and let it rise in a warm place for 15 minutes (I used the proofing setting on my oven). At the end of the first 15 minutes, punch it down and let it rise again for another 15 minutes. 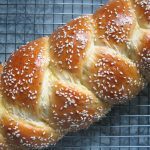 At this point you can shape it into buns, bread or rolls – allow your creations to rise for 30 minutes to an hour again – and then bake them at 350 for 15 to 20 minutes until golden brown. HI!!! You are forgetting an important step! Once dough is shaped into buns, leave them to rise for 1 hour before cooking!